"Kassenba no Shidarezakura(Weeping Cherriesin Battlefield)" are two red weeping cherry blossom trees standing close together and are also called the husband and wife cherry couple. It is said to have been the place where the warload Yoshiie Minamotobattled with and the brother Abe no Sadato and Muneto in the late of the Heian period. These cherry treesareabout 180 years old andsaid to be the grandson cherry trees of the Miharu no takizakura and there is the parent tree, the "Fukuda Temple Weeping Cherry Tree"nearby. 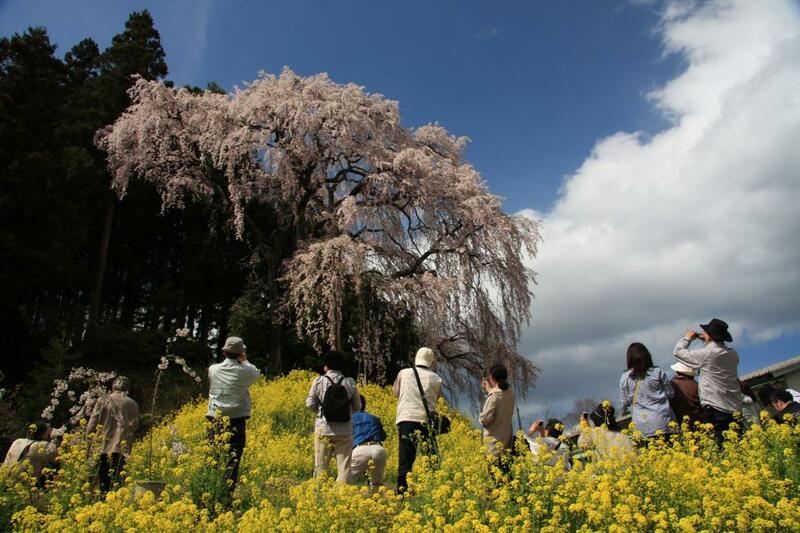 The flowering situation of the cherry blossoms is announced on the website of the Iwashiro Tourism Association.From mid to late April, in the surrounding terraces there is a riotous profusion of field mustards and cheery blossoms in beautiful natural color contrast. The promenade, "Iwashiro Cheery Corridor" stretches out from the Kassenba no Shidarezakura (Weeping Cherriesin Battlefield) to Michi no Eki (roadside station) Sakura no Sato.